You are here: Home / BLOG / Uncategorized / How to recognize that your parents are getting old? How to recognize that your parents are getting old? The decision of sending your old parents in a care home or providing continuous care such as live-in carer is always difficult for the whole family. The elderly people find it difficult to to accept any changes especially a significant one like moving into a care home or hiring a live-in carer can be a quite a challenge. It can be also awkward for their loved ones because they feel it is a big step for the whole family. How shall we behave in such circumstances? We definitely need to remain calm and think things through to find the best solution for all in this situation. It is worth to ask yourself and the potential resident of the care home some detailed questions that should help to make the right decision. Moving into a care home makes older people to worry in advance. It is especially difficult for those who were used to living independently and had been living in their own home for a long time. The thought of the necessity to leave your present household where you had fond memories makes you feel sad and sorrowful. The children view their parents differently. The decision of admitting your parents into a care institution poses an enormous challenge for the children of the elderly parents. Many of them still see their aging parents as strong, healthy, lot younger individuals than they actually are. They got used to seeing their parents as help in making important life decisions, reassuring, caring for their grown-up children. Therefore they find it difficult to change their previous perception and notice that their mum or dad struggle to cope on their own with their daily living. You could describe one of many similar situations faced by the carers of the elderly people. During the chat/interview regarding the potential admission their children often reply that the parent is still fit and able to care for themselves. In reality quite often it turns out that the future residents are frail, unkempt and wearing grubby clothes. Once you start inquiring them, they admit that their legs are too weak to walk longer distances. 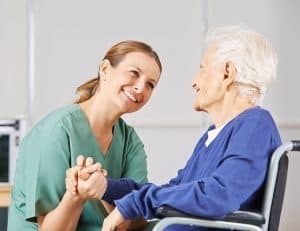 This indicates that such old person should move into the care home where he will have all the amenities in one place where they can rely on 24 h assistance of professionally trained care givers. Everybody wishes for their parents to live independently as long as possible, but the decision making abilities and self-care will deteriorate in time. The grown-up children are often unable to spot the symptoms of deteriorating health of their parents. They dismiss any radical decisions which would drastically change the current status quo of their family live. The most difficult moment for them is to admit that their parents require continuous care. When the loving son or daughter realize that their father or mum need to be cared for they become tearful and sad as it was difficult for them to accept the new circumstances involving the parents. Does your parent need the professional care assistance? Does your parents claim that they eat regularly but you discover spoiled food in their fridge? Do they cover their bruises so nobody notices that they had a fall or bumped into things? Do they wear the same clothes for days or weeks? Does your mum or day think they hear strange voices at night? Does their household and garden look tidy as they used to be? Do they take prescribed medications on a regular basis? Can they still react adequately to sudden situations? Can your mum or dad handle simple domestic tasks? The answers to these and similar questions will help you to determine if your parents require thorough, professional and continuous care? It is mainly up to the grown-up children to decide how their parents will spend the dawn of their life. However, the decision to move them to the care home or hiring a live-in carer is a difficult one and delaying it will not resolve the dylema. Providing your parents suitable care and security is the main priority. https://veritascare.co.uk/wp-content/uploads/2018/02/work.jpg 948 1230 veritasblog https://veritascare.co.uk/wp-content/uploads/2018/02/logo-veritas3.png veritasblog2018-04-05 13:55:332018-07-30 11:34:43How to recognize that your parents are getting old?